Aeonium is a group of about 35 species of small to medium-sized subtropical succulents in the family Crassulaceae native to parts of northern Africa and nearby islands including the Canary Islands, Cape Verde Islands and Madeira. 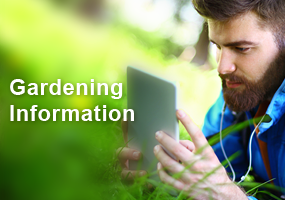 The names of types offered as garden specimens are often confused and inaccurate. A. arboreum is a Moroccan species that was probably used to develop many of the most commonly available ornamental types. Most of those sold in nurseries as “Aeonium arboreum” are actually hybrids, different from the few natural populations left on the Atlantic Moroccan coast. True species can be obtained from specialist nurseries. These plants are grown primarily for their attractive rosettes of waxy leaves. The leaves may be solid green, green variegated with creamy yellow, bronzy-purple, or dark purple. Mature plants of A. arboretum and related hybrids grow about 3 feet tall. As the plants grow new leaves, older leaves eventually die and fall off, leaving a clump of leaves at the end of naked stems on old plants. 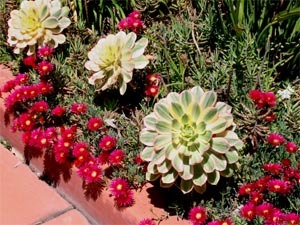 The terminal rosettes can be cut off and replanted to keep the plant smaller and also delay blooming. Other species, such as A. tabuliforme and A. smithii do not develop long stems, so always remain compact. 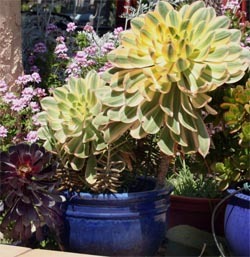 Other species of Aeonium vary in size (ranging in height from 1½ to 6 feet), branching pattern, and color. Mature rosettes produce flower stalks about 8 inches long in winter with conical clusters of flowers at the end of the stem. The small, star-shaped flowers may be creamy white, yellowish, golden, pink or red, depending on the species or cultivar. Papery seed pods may eventually develop. In all species, the rosettes die after blooming. Therefore, a branching species will continue to grow after flowering, while single-headed species can only be propagated by seeds. All of the unbranched species are less common in cultivation because they must be grown from seed. 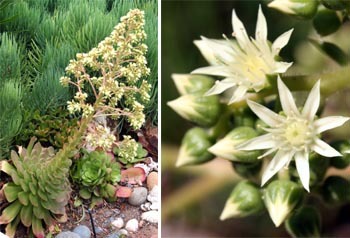 An unbranched Aeonium blooming and closeup of the flowers. The dramatic architectural shape of aeoniums makes them excellent specimens to contrast with many other plants. The dark-leaved types make a strong visual statement and look striking against a pale wall or fence or mixed with plants with blue or silver foliage. They are most impressive in areas where they can be grown outside year round, but they can be used effectively as bedding plants or in containers. 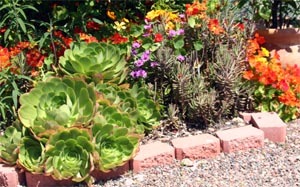 Aeoniums need porous, well-drained soil like other succulents do. Aeoniums do best in warm, dry climates and will not survive Midwestern winters outside. However, they are very suitable for container culture, so can easily be preserved by bringing them indoors before nighttime temperatures fall below 40ºF. They make good subjects for dish gardens and can be suitable as houseplants if you have very bright light. Even though aeoniums need direct sunlight, be cautious about moving plants kept in the house for the winter abruptly into full sun outdoors for the summer – gradually acclimate the plants to higher light intensity or they will sunburn. 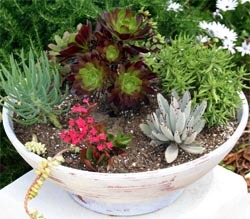 Aeoniums are a good addtion to a dish garden. Grow aeoniums in porous, well-drained soil. Outdoors, raised beds may be helpful to provide the drainage needed. For containers, a commercial cactus mix is suitable, or create your own growing medium. Use half soilless medium mixed with your choice of small washed gravel, sifted sharp sand (sifted to remove all the fine particles), turkey grit, decomposed granite, perlite, and/or pumice. If potbound, repot when new growth begins, moving to a slightly larger pot. In their native habitat these plants would grow in spring and fall and go dormant during the hot, dry summer and mild, wet winter. In our very different climate, however, they will continue to grow throughout the summer. 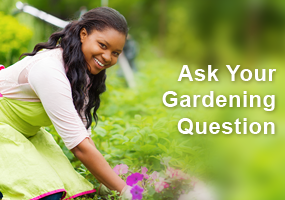 Water deeply during the growing season, allow the growing medium to dry thoroughly between waterings. Gradually reduce watering at the end of the season. 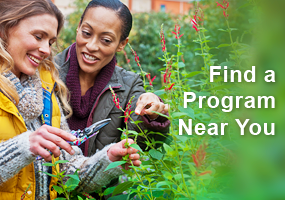 During the winter months, keep under cool temperatures (50°F) and restrict water to just enough to keep the foliage from shriveling. 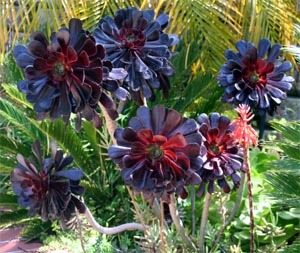 Aeoniums offer dramatic contrast to many other flowering plants. These plants can be propagated from seed, division (for those types that produce offsets or side rosettes), and cuttings. Take cuttings in spring through summer. Cut off a rosette and let it harden off for three days or more. Then place the cutting directly into sharp sand or a well-drained mix to root. Aeonium arboreum – the type species has shiny green, spatulate leaves, which in strong light often appear overlaid with coppery tones, but this species is quite variable. Aeonium arboreum ‘Albovariegatum’ – has white margined leaves. A. arboreum ‘Atropurpureum’ – has dark purplish-red leaves when grown in full sun (green in lower light). The plant grows up to three feet tall and produces yellow flowers from late winter to spring on mature rosettes. This plant received the Royal Horticultural Society’s Award of Garden Merit in 1999. Aeonium arboreum ‘Luteovariegatum’ – has green leaves with a narrow to wide light yellow margin, and some pink tints with age but it is not usually tricolored. A. arboreum ‘Schwartzkopf’ or ‘Zwartkop’ (and various other spellings) – has glossy leaves so dark purple they appear black. The color remains throughout the winter if kept in bright light, although the new growth is greener. The leaf blades tend to be spoon-shaped and narrower than ‘Atropurpureum.’ This branching shrub grows up to three feet high and produces yellow flowers in summer, but will stay much smaller in a pot. It was awarded the Royal Horticulture Society’s Award of Garden Merit in 1993 (along with a few other cultivars and species). A. canariense – native to Tenerife, Canary Islands, has short stemmed rosettes of somewhat sticky green leaves with dense white hairs on both surfaces. The rosettes grow up to 20″ in diameter before producing large pyramids of yellow flowers. This plant produces offsets. A. decorum – is a multibranching type with red-edged leaves and pink flowers. It grows 1-3 feet tall with rosettes 2½” wide. A. tabuliforme – produces large, flat, dinner plate-sized rosettes. The rounded, soft-green leaves overlap to form a swirled effect.The plants a foot or more across, but only a few inches high. It flowers after three years and does not produce offsets, so must be propagated by seed. Unlike other types, it needs protection from hot sun. A. undulatum – bears bright glossy green, 8-12″ rosettes atop a thick stem with few branches, up to 3 feet tall. doing a paper for my propagation class at Cuyamaca College in El Cajon Ca.. Is cuttings the only way to propagate? Can you propagate with seeds? Have their ever try tissue culture? Kevin, I’ve grown aeonium from seeds and have lots of extra seeds and seedlings that I was considering donating to the hort program at Cuyamaca. I’ll get in touch with Fausto.